CUPERTINO, CA--(Marketwired - Nov 7, 2013) - If you think that smartphone battery images can only appear one way -- green, blue or boring -- think again. Baidu (NASDAQ: BIDU), the world's leading Chinese search engine, today announced that its popular app DU Battery Saver has unveiled a fun new feature that allows you to customize your battery skin and share it with your Facebook friends. To promote this new feature, DU Battery Saver -- the world's leading battery saving app used by 25 million people -- is launching a Facebook contest where the top three most-liked, user-submitted battery skin photo posts will win Android smartphones. "From home screens to wallpaper, people love to personalize their phones to reflect who they are," said DU Battery Saver Product Manager Carol Lu. "Our team at DU Battery Saver is proud to be the first among battery saving apps to launch a customizable battery skin feature. Along with our ranking as the world's leading battery saving app, DU Battery Saver is embracing our motto to give users 'more power, more fun'." DU Battery Saver offers one-tap battery optimization, real-time battery usage monitoring, personalized energy profiles and smart charging. It recently reached 4.7 out of 5.0 stars on the Google Play Store, which makes it one of the highest ranked battery saving app available for Android. DU Battery Saver was the first battery app to introduce a single-button optimization feature, and now, with the addition of customizable battery skins, it is also the first app to make battery saving social. For more information and to download DU Battery Saver for free, visit: http://duapps.com. Baidu, Inc. is the leading Chinese language Internet search provider. As a technology-based media company, Baidu aims to provide the best and most equitable way for people to find what they are looking for. In addition to serving individual Internet search users, Baidu provides an effective platform for businesses to reach potential customers. Baidu's ADSs trade on the NASDAQ Global Select Market under the symbol "BIDU." Currently, ten ADSs represent one Class A ordinary share. 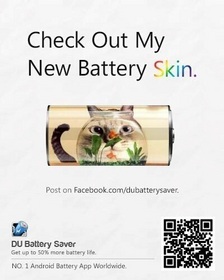 DU Battery Saver app makes battery saving fun - customize your battery icon skin, share with friends and win a smartphone!